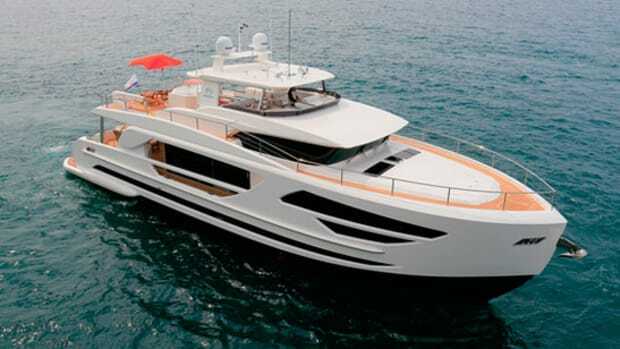 Yachts Miami Beach is perennially filled with the most lavish, look-at-me yachts in the world. 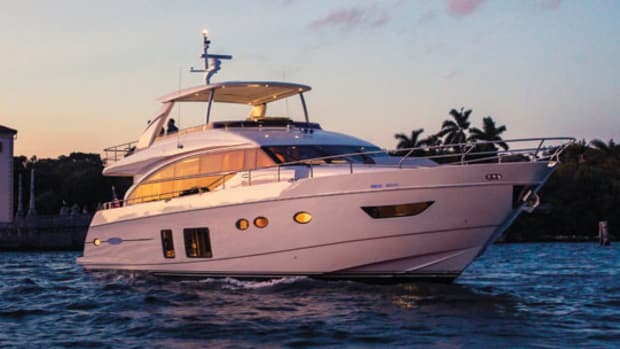 From sleek silver center consoles to superyachts and cruisers with fold-down-in-out-and-up gunwales, after a while you almost become numb to the surprises that are behind every turn. Oh, look, there’s a hidden hull door that reveals a secret tender garage. Yawnnn, I’ve seen that before. 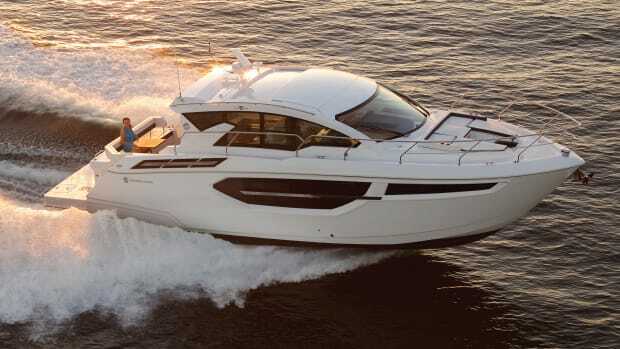 Because of this fact, I was surprised by how much the Cruisers 50 Cantius surprised me. 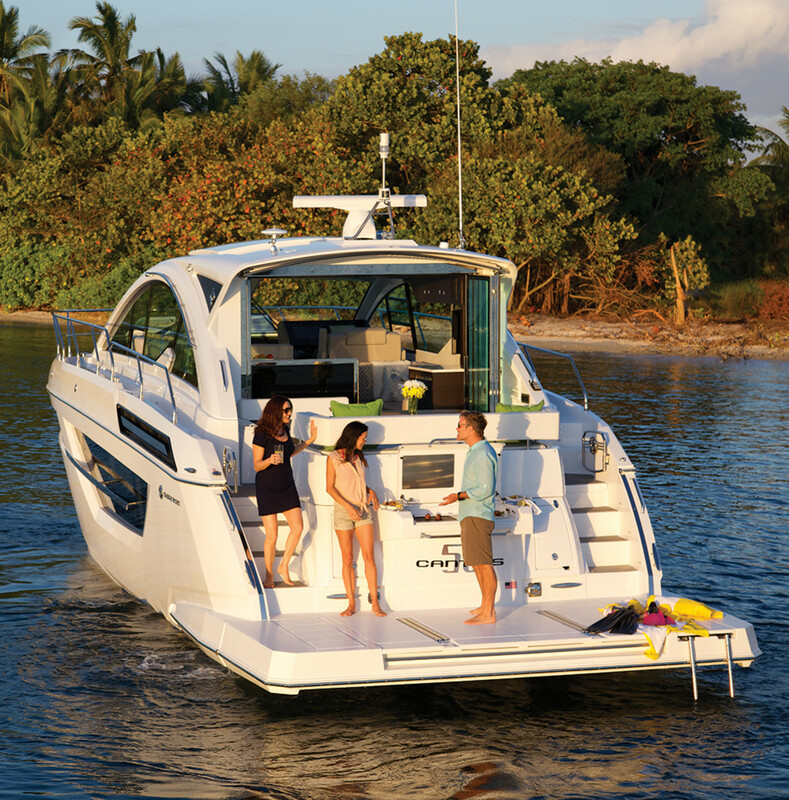 I was first introduced to the Cantius line on a trip to Bimini aboard the 45, which left me with the impression that what you see is what you get with these models. 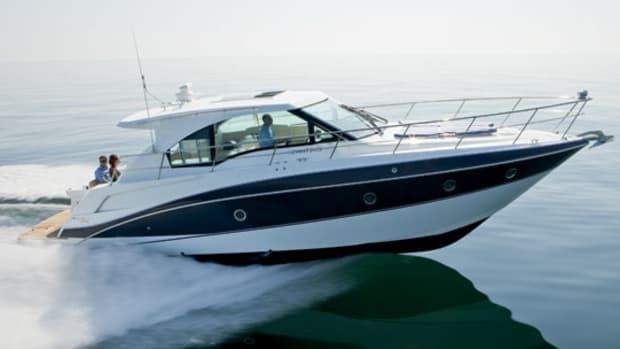 They’re solid, steady boats that are neither too flashy, nor too dull. They’re boaters’ boats, plain and simple. 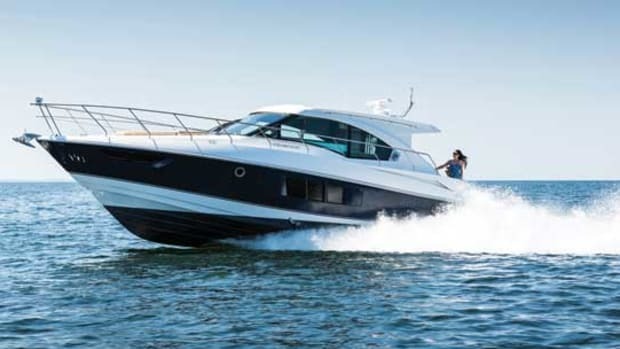 The newcomer to the increasingly popular Cantius series is the 50, which falls between the brand’s 45- and 54-footer. 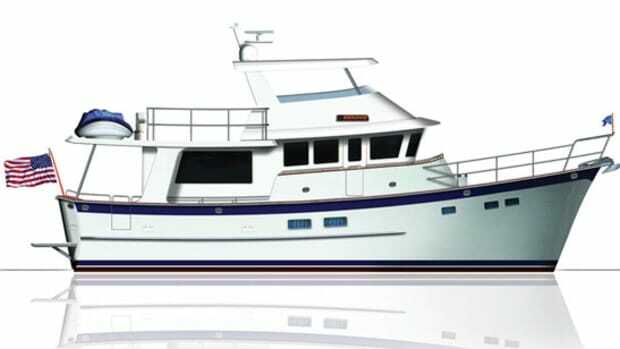 The line ranges from a 41- to a 60-footer, and the builder has already seen more than 300 of these boats sold. Walking aboard with the Director of Marketing, Matt VanGrunsven, the first thing I noticed was how large the swim platform is. At 54 inches long, the hydraulic platform can accommodate an 800-pound tender. Looking at the space, which included the big Kenyon electric grill with an outlet beneath it, I realized this could double as the back deck of a house. Place a few chairs there and you have a nice spot to enjoy a meal with your toes in the water. Sounds nice, doesn’t it? He smiled. “It’s funny you say that. We had people fighting for that very spot on the ride over to the show.” Surely that’s the telltale sign of a lasting design element. 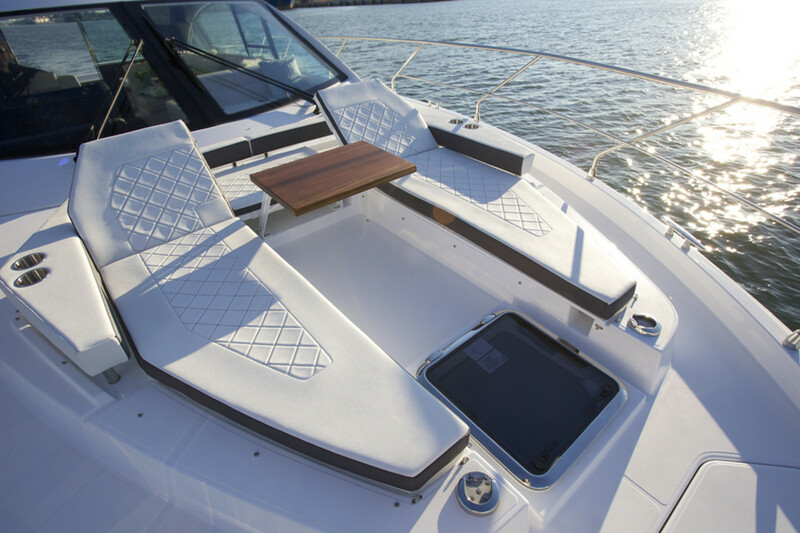 A nice feature that was used extensively during my time aboard the 45 in Bimini was the large seating area to port of the helm. I sat at the helm with the owner as we easily conversed with his wife and kids, who were in those seats. That experience sold me on the configuration. I was glad to see the same arrangement on the 50. The accommodations consist of a smart, three-stateroom, two-head layout with ample headroom and a contemporary-yet-not-too-modern, charcoal-gray-stained oak veneer throughout. 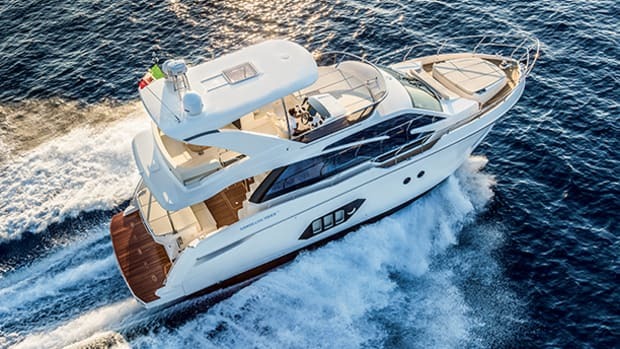 The amidships master boasts exceptionally large windows, a full-length settee to port, and plenty of space, thanks to the Volvo Penta IPS600s. The nice proportions throughout are no accident—extensive tweaking of full-scale mockups is a staple of the build process at the Wisconsin-based Cruisers plant. The bow area on the 50 was perhaps my favorite spot aboard. A large sun sail clips onto removable poles (which have dedicated stowage) and covers the lounge. A pop-up table in the center looks like a nice spot to place a laptop when “working remotely.” It’d surely be an even better location for a bottle of wine and snacks at sunset. Pop-up backrests lend versatility to the space, so when you’re tired of laying down (it happens), you can sit up. Looking from the bow down the dock at the other Cantius models on display at the show, I noticed just how similar the boats are, despite their varying LOAs. 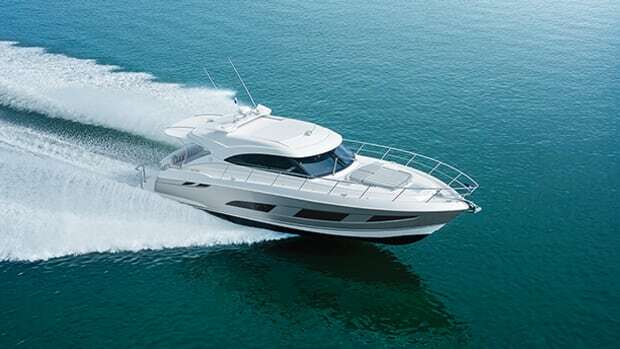 The 50 seems to possess the very best features and qualities of her siblings, which is what we all hope for in a refreshed model. 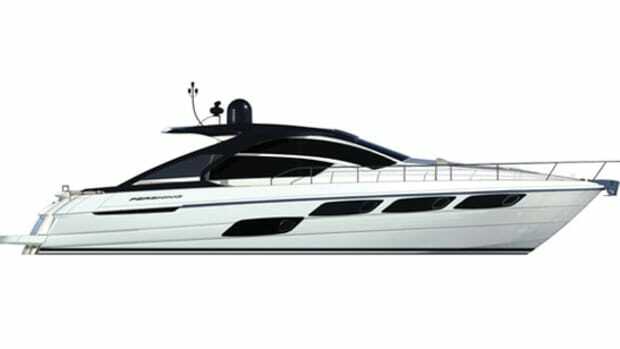 Joining the Cantius family this summer will be the 42. If she is anything like her bigger sibling, she, too, will be a pleasant surprise. 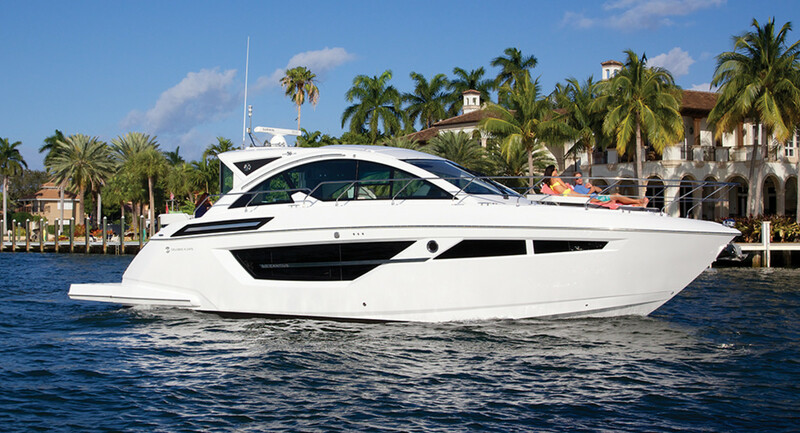 This article originally appeared in the June 2017 issue of Power & Motoryacht magazine.